The dirty truth (and the good news) on hand hygiene. 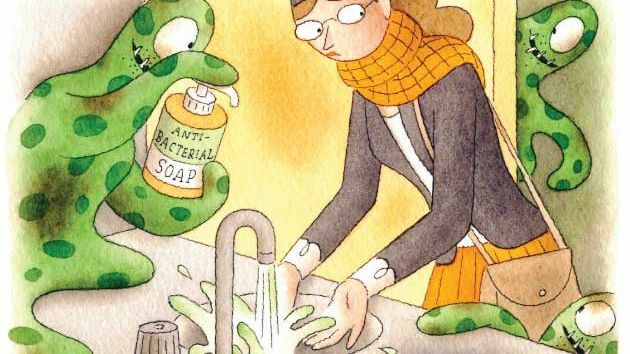 To hear the industry tell it, anti-microbial soaps are humanity’s last best option in a war against germs that lurk everywhere. On a site called Fight Germs Now—”the official source on anti-bacterial hygiene products”—the American Cleaning Institute sings their praises, warning that “sometimes plain soap and water is not good enough.” The fast-growing market for anti-bacterials—most of which rely on an active ingredient called triclosan—is estimated at $1 billion. Triclosan is also in items such as socks, yoga mats, cutting boards, ice cream scoops, and pencils. No wonder the Centers for Disease Control and Prevention (CDC) estimates that it’s present in the urine of three-quarters of Americans. But on December 16, the FDA issued a proposed rule that would require companies to provide “more substantial data to demonstrate the safety and effectiveness of antibacterial soaps” before selling these products. The move is in response to the mounting evidence that triclosan might not be as effective as manufacturers claim. Bill Schaffner, a professor of preventive medicine and infectious diseases at Vanderbilt University, points out that triclosan soap products are useless when it comes to most seasonal infections: They target bacteria, not the viruses that cause colds and flus. And they don’t work any better on bacteria than standard soap—which also gets rid of viruses. In a 2008 review in the American Journal of Public Health, researchers scrutinized hundreds of hand hygiene studies and found “little evidence” that anything beat regular washing in reducing the symptoms associated with infectious gastrointestinal or respiratory illnesses. Over the past 15 years, the FDA has approved just 15 newantibiotics—in the preceding 15 years, it approved 40. Triclosan also gets into waterways, where it could harm aquatic life. A 2013 Loyola University simulation found that the chemical caused “dramatic” algae die-offs and altered the natural composition of bacteria in streams—a potential problem for higher species, including vulnerable frogs and salamanders. Other recent studies have found that triclosan disrupts hormone production in lab animals. The public health implications of triclosan led the European Union to ban it in 2010 from any product that might come into contact with food. Two years later, Johnson & Johnson pledged to phase it out entirely. The Food and Drug Administration was supposed to deliver a ruling on the chemical’s safety in 2012, but it still hasn’t completed its review. Meanwhile, with traces of the stuff showing up in Minnesota lakes, lawmakers there are pushing what would be thenation’s first triclosan ban. Note, though, that alcohol doesn’t remove actual dirt—which is why the CDC recommendsregular soap and water as the best all-around option outside hospital settings. And hand sanitizer won’t work against the stomach bug norovirus or the armored spores of C. difficile, a serious and sometimes life-threatening infection most often found in hospitals: “You literally have to wash the spores off your hands and flush them down the sink,” Schaffner says. But for virtually all other germs, alcohol is very effective. “During flu season I am in favor of abundant use of alcohol-based hand sanitizers,” he says. So if you’re a germophobe like me, it doesn’t hurt to grab a bottle of Purell for the road, but you might consider ditching those anti-bacterials. Contrary to industry spin, most of the time, plain old soap and water is good enough. After more than 20 years of serving as a business lawyer for a number hugely successful businesses, I know that becoming a prosperous company most often depends on being in the right market, at the right time, with the right solution, with sufficient capital, with the right management team. Failing to incorporate and observe corporate formalities. Business owners expose themselves to personal liability by failing to use a correct corporate entity to operate the business and failing to observe the necessary corporate formalities – such as co-mingling business assets and personal assets. Failing to have an owner’s agreement. Business owners enter into business together with dreams of success and great optimism. However, the unexpected occurs, priorities change, divorces occur, owners die, friendships go bad, disagreements happen, some owners work harder than others, and the direction of the business changes. 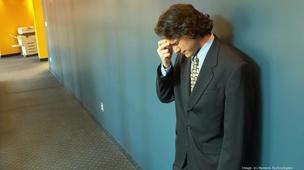 Failing to enter into a written agreement anticipating such situations frequently results in the demise of a business. Promising ownership to employees without due care. Promising ownership to employees, strategic partners and vendors without written agreements specifying defined vesting schedules and ownership restrictions and using equity as currency without considering the long-term consequences is frequently a costly and irrevocable mistake. Underestimating the cost, time and unpredictability of litigation. Litigation is an awful way to resolve business disputes, typically requires significantly more time, money and attention than anticipated and litigation results are rarely completely satisfying. Failing to protect or respect intellectual property. Business owners must take steps to protect trademarks, trade names, copyrights, patentable ideas, software, trade secrets and other intellectual property, including entering into agreements with all employees and independent contractors regarding assignment of intellectual property and confidentiality agreements. Owners must also ensure not to infringe on the intellectual property rights of others. Mistakenly relying on oral agreements. All important business arrangements, terms and conditions and agreements should be in writing. Over time, memories differ, owners of vendors and customers change, and confusion and disagreements arise. Disputes will be avoided if all agreements are in writing. Not understanding contracts. Careful lawyers select every word and every provision in a contract with a specific purpose. Business owners should not enter into a contract if they do not understand and agree with every provision. It is too expensive and takes too long to rely on a judge or arbitrator to interpret a vague contract. Owners should not agree to be bound by material provisions they do not find acceptable. Using poor contract forms for critical agreements. Certain agreements will be used repeatedly, and those standardized agreements should be carefully prepared to avoid litigation and limit the business’ potential liability. Not dealing with issues directly and in writing. When problems arise with another party, business owners should review the applicable contract, determine the appropriate actions, and document issues in writing. Failing to document issues in writing from the outset leads to misunderstandings, may result in unintentionally waiving rights, and complicates resolution. Treating employee issues too casually. Mischaracterizing employees as independent contractors, maintaining a locker room atmosphere, failing to pay required overtime wages, ignoring applicable employment laws, or paying employees “under the table” are very expensive mistakes. An army of attorneys are willing to take these cases on a contingency basis, and many claims include mandatory attorney’s fees for the employee and punitive damages. Not entering into agreement with employees. When appropriate, enter into non-competition, non-solicitation, confidentiality and non-competition agreements with key employees. Failing to pay taxes. As tempting as it may be to delay paying applicable taxes as a method for “managing cash flow,” failing to pay income, sales and payroll taxes will result in fines, penalties and personal liability. Not appreciating that every company is a technology company. Today, every company is a technology company. Engaging in business over the Internet, licensing critical software, and storing data in the cloud trigger critical legal issues that are not readily apparent and require particular attention. Ignorance of the law. Ignorance and complexity of the law are not defenses for ignoring laws or not complying with applicable local, state and federal laws. Business owners must understand and comply with all applicable laws. Misunderstanding or lacking insurance coverage. Maintaining proper insurance coverage often avoids litigation. In situations where litigation cannot be avoided, insurance coverage will protect the business from having to bear the exorbitant costs of litigation. Hiring subpar professional advisors. Business owners must select competent attorneys and accountants with specific experience in relevant industries that approach the relationship as team members and not by-the-hour hired guns. Knowledge alone of the above list of legal mistakes frequently made by business owners is not sufficient to ensure the success of a business. Business owners who invest the time and energy to address these issues proactively are more likely to avoid costly consequences and to achieve the maximum potential for their businesses. The findings, based on natural language analysis technology, will allow researchers to stack up narcissistic tendencies against company performance to determine if self-centered CEOs help or hurt the bottom line. “Is narcissism, generally viewed as a personality defect, actually a good thing?” said Professor Alex Frino, dean of Australia’s Macquarie Graduate School of Management. “Does the world in fact need more narcissistic CEOs? Or is it a trait we should be actively teaching future leaders to avoid? Gelsinger took over at Palo Alto-based VMWare in September 2012 after turns at EMC and Intel. The company’s shares have remained essentially flat over the last 12 months. VMWare increased profit in the quarter ended Sept. 30 by 66 percent to $261 million. Revenue rose 13 percent to $1.29 billion. This shocking video was taken December 23rd 2013 with a quality Geiger Counter at Pacifica State Beach (Surfers Beach), California. Background radiation is 30 CPM. Near the ocean it’s 150 CPM. The fine mist coming from the ocean waves seems to be what makes the Geiger Counter jump. We all must come to the realization that swimming in the Pacific Ocean (let alone eating anything out of it) is a thing in the past. And it’s only going to get worse, as it’s unstoppable. This is by far the worst man-made disaster in human history, and our garbage media and government say nothing. Mad enough at the “1%” yet? It’s our own damn fault! Pierce H. McDowell III, president of South Dakota Trust Co., in his office in Sioux Falls. The newspaper clipping is from March 1934, when a notorious gang robbed the local Security National Bank. McDowell’s grandfather worked as a trust officer at the bank. According to family lore, during the holdup, Baby Face Nelson poked a Thompson machine gun in his grandfather’s belly. Among the nation’s billionaires, one of the most sought-after pieces of real estate right now is a quiet storefront in Sioux Falls, South Dakota. A branch of Chicago’s Pritzker family rents space here, down the hall from the Minnesota clan that controls the Radisson hotel chain, and other rooms held by Miami and Hong Kong money. Don’t look for any heiresses in this former five-and-dime. Most days, the small offices that represent these families are shut. Even empty, they provide their owners with an important asset: a South Dakota address for their trust funds. In the past four years, the amount of money administered by South Dakota trust companies like these has tripled to $121 billion, almost all of it from out of state. The familiesneedn’t actually move to South Dakota, or deposit their money at a local bank, or even touch down in the private jet. Little more than renting an address inSioux Falls is required to take advantage of South Dakota’s tax-friendly trust laws. South Dakota’s sudden popularity illustrates how, at a time of rising U.S. economic inequality, the wealthiest Americans are embracing ever more creative ways to reduce taxes legally. Executives atSouth Dakota Trust Co., one of the biggest in the state, estimate that one-quarter of their business comes from special vehicles known as “dynasty trusts,” which are designed to avoid the federal estate tax. Creation of such trusts has surged in recent years as changes in federal law enabled more money to be placed in them. While the super-rich use various tools to escape the levy – – some have exotic names like the “Jackie O” trust and the “Walton GRAT” — the advantage of dynasty trusts is that they shield a family’s wealth forever. That defies the spirit of the estate tax, enacted almost 100 years ago to discourage the perpetuation of dynastic wealth. The dynasty trust isn’t South Dakota’s only lure. Another attraction, for customers in places like New York and Massachusetts, is the chance to shelter their investments from income taxes in their home states. In November, a government commission in New York recommended tightening trust laws to avoid income-tax leakage to states like South Dakota, estimating the change would raise an extra $150 million a year. Still others are drawn to South Dakota’s iron-clad secrecy, and protections of trust assets from creditors and ex-wives. Many of these features emulate those available in Bermuda and other island havens. Some wealthy families are also attracted by South Dakota rules that enhance their control over investment decisions and make it easier for them to set up their own trust companies rather than rely on a bank trustee. In South Dakota, a farm state that’s home to two of the 10 poorest counties in the U.S., lawmakers say they’re bolstering the trust industry to generate work for local law firms and bankers, and forge ties with prosperous families that may one day decide to build a factory or a warehouse here. The legislators are turning the Mount Rushmore State into the Bermuda of the prairie. As much as anyone, Pierce H. McDowell III can take credit for this transformation. He works upstairs from the hall of empty offices, on the second floor of the old Kresge five-and-dime, where he’s president of South Dakota Trust Co.
At 56, McDowell has been promoting the state he affectionately calls “North America’s Siberia” for most of his career. In 1993, he published an article in a national estate-planning journal recommending that wealthy people across the country establish dynasty trusts in South Dakota. Because the estate tax is imposed on large fortunes at death, McDowell wrote, wealth that’s big enough to last for generations will have to contend with multiple tax bills. A father pays the tax when he leaves his money to his children, who pay again when they pass it down. Each generation faces a toll. The current rate is 40 percent. McDowell’s solution was for the father to establish a never-ending trust that pays each generation of heirs only what they spend, while the rest of the money grows. In 1993, when McDowell was writing, that wasn’t possible in 47 of the 50 states because of an ancient rule limiting the duration of trusts to the lifetime of a living heir, plus 21 years. The concept has been a part of Anglo-American jurisprudence since a case decided by England’s Lord Nottingham in 1681. South Dakota repealed that rule in 1983, and unlike Idaho and Wisconsin — the other two states without the provision — it had no income tax. So, McDowell wrote, a trust set up here could shield a big fortune from taxes for centuries, escaping tax bills as it hands out cash to great-great-great-grandchildren and beyond. Over dinner at a Sioux Falls restaurant this month, McDowell elaborates on the idea. He has curly gray hair and a quick laugh, and he’s wearing an open collar under a quilted winter vest. He’s known around town for making the one-mile trek to his office on a fat-tire bicycle, even in December. “I like to equate it to the wine in this glass,” McDowell says, covering his Cabernet with his right hand. “Here you’ve filled it to the rim and push it downstream to the next generation. You can sip from it, you can have the equivalent of outright ownership, but you don’t own it under the law. Your children — they too will have the opportunity to sip from it.” He cups his hands as if to cradle the precious liquid. “In most states, the glass has to pour out completely in a generation or two. We did away with that in 1983.” He chops the air with his hand. McDowell’s sales pitch got far more attractive in the past few years, when Congress gave the idea an inadvertent boost. “I call it the trust tsunami of 2012,” McDowell said. The reason most Americans don’t have to worry about the estate tax — fewer than one in 700 pay it — is because Congress applies the tax, and related taxes on other transfers to heirs, only when a fortune exceeds certain thresholds. For complicated reasons, the amount that most people can place in dynasty trusts is usually limited to one of these exemptions, which was set at about $1 million throughout the 1990s. It’s the size of the glass into which a wealthy family can pour the wine. Throughout the 2000’s, this exemption rose, and by 2011, it reached a record $5 million per individual. The temporary law was scheduled to expire after 2012, at which point it would revert to $1.4 million. Congress didn’t act to make the higher amount permanent until Jan. 1, 2013. With the fate of the exemption uncertain, McDowell said his clients rushed to meet the deadline during the last few months of 2012, creating billions of dollars’ worth of new trusts. He had to turn away new customers, and hire retirees to handle the crush of paperwork. There were late nights and shortened Christmas vacations. By the end of the year, he said he’d added about 500 trusts to his rolls, more than twice the number in a typical year. For the richest families, even a $5 million dynasty trust represents only a fraction of their fortunes, so lawyers have invented complicated strategies to squeeze bigger sums into the vehicles — as much as $39 million, according to a presentation by McDowell’s firm published last year. Such aggressive maneuvers, once common, have become rare in recent years, McDowell said. McDowell’s firm now administers trusts worth $14 billion, according to its website, almost all of them originating in other states. An additional $75 billion is overseen by the offices downstairs, each of which is technically a separate trust company catering to just one family. The companies pay rent to McDowell for the office space, and fees for handling paperwork and administrative duties like filing tax returns; McDowell declined to comment on the price of these services. All of these are necessary steps if the families want to prove that the trusts are truly South Dakotan. The tenants include companies like Carlson Family Trust Co., serving the Minnesota family behind Radisson and the TGI Friday’s restaurant chain, and JHN Trust Co., linked in state incorporation papers to the family of the late New York hedge fund pioneer Jack Nash. Other companies have ties to Thomas Peterffy, the Connecticut online-brokerage billionaire; the descendants of a namesake of the Dillon Read & Co. investment bank; and the heirs of a Peruvian sugar plantation, state filings show. Trusts overseen in the Kresge five-and-dime building hold all kinds of assets, from stakes in private companies to a castle in Italy. While their holdings aren’t public, securities filings sometimes offer a glimpse. In July, the two top executives at Monster Beverage Corp. (MNST), the Corona, California-based energy drink maker, shifted $478 million of their stock to undisclosed “entities” controlled by a trust company based in the building. In 2010, the Pritzker family, whose members include U.S. Commerce Secretary Penny Pritzker, revealed in a securities filing that one branch had moved $360 million of Hyatt Hotels Corp. (H)stock to trusts overseen by a native South Dakotan named Thomas J. Muenster. Muenster, whose sister married a Pritzker, maintains an office in the Kresge building. The SEC disclosures don’t show whether any of these moves resulted in federal or state tax savings; the amounts exceed what one individual could put in a dynasty trust. Most state and federal tax filings are private, and McDowell declined to comment on specific clients. He said most families that set up private trust companies are attracted by South Dakota’s flexible trust management rules rather thantax avoidance. The Monster executives declined to comment through a spokeswoman, as did the Carlson family. Jay Robert Pritzker, his sister Penny Pritzker, and his brother-in-law Muenster didn’t respond to messages seeking comment, nor did Peterffy or Joshua Nash of JHN. In 2007, the Wrigley family, heirs to the candy fortune, transferred oversight of family trusts holding $1.9 billion of company stock to a private trust company in the Kresge building, according to an SEC filing. The family picked South Dakota because of the state’s favorable laws governing the formation of private trust companies, the Chicago family said last week in a statement attributed to William Wrigley Jr. The family said the move didn’t involve any state or federal tax savings. President Barack Obama has called for closing the dynasty trust loophole in annual budget proposals, even though the change wouldn’t boost tax receipts under his administration. The impact of dynasty trusts on federal revenue is far in the future — though potentially enormous, said Lawrence Waggoner, a retired professor at University of Michigan Law School. One clue to how much wealthy families might save comes in McDowell’s 1993 article. Just $1 million invested in a dynasty trust, and earning 12 percent a year, would swell to $1.9 billion in 85 years, he wrote — compared with $488 million if the same trust was located in New York, subject to both state income taxes and the federal estate tax when it expired. Beneficiaries must still pay personal income tax on distributions from these trusts, McDowell said. If a family runs out of heirs before a trust is exhausted, the leftovers are typically directed to a charity, he said. Loosening local laws to attract out-of-state business is a proven tactic for South Dakota. In 1981, it lured Citicorp’s credit-card business — and hundreds of jobs — from New York by becoming the first state to repeal limits on interest rates. Other lenders followed. The credit-card industry, along with a boom in farm profits, help explain why Sioux Falls’ unemployment rate of 2.9 percent is less than half thenational average. Pockets of poverty persist in American Indian reservations in the state’s midsection. So far, the trust industry’s contributions to state coffers have been modest. Without an income tax, South Dakota doesn’t get revenue directly from the trusts. Companies like McDowell’s pay franchise taxes on their earnings, a levy that raised about $1.2 million last year, according to the state Department of Revenue, out of a state budget of about $4 billion. Nor has the industry become a major employer. The state estimates that about 100 South Dakotans work for locally chartered trust companies. Then there are an unknown number of jobs in local trust units of national banks such as Wells Fargo & Co. (WFC), and more work for local law firms and accountants. The trusts aren’t required to hire local money managers or invest in local businesses. By comparison, a typical Wal-Mart Supercenter, of which there are two in Sioux Falls, employs about 350 people. When he’s away on state business in New York or Chicago, Daugaard said, he sometimes takes time to meet with wealthy clients of the South Dakota trust industry. He said he thanks them for doing business in his state. McDowell’s 1993 article publicizing South Dakota’s advantages helped him land a job at Citicorp, setting up trusts for the bank’s clients. As the lender started promoting South Dakota’s advantages nationally, Delaware passed a similar law allowing perpetual trusts. Alaska was next, after a fishing trip there inspired a New York estate planning lawyer named Jonathan Blattmachr to draft the legislation. A half dozen states, including Nevada and New Hampshire, now jostle for the business of the super-rich. To try to maintain its edge, South Dakota assembled a permanent task force comprising industry players such as McDowell to monitor developments in other states and propose new legislation each year. In March, Governor Daugaard signed the group’s latest submission into law, making it harder for former spouses and their offspring to tap certain trust assets. The bill was sponsored by the House’s Committee on State Affairs, whose chairman, David Lust, is also House majority leader and head of the trust task force. When the part-time legislature isn’t in session, Lust works at a Rapid City law firm where one of his partners is a leading trust lawyer. Lust receives no “direct benefit” from the legislation, he said. Bernie Hunhoff, a Democrat and the House minority leader, said some in his caucus roll their eyes when the task force’s annual proposals come up for a vote. They’re aware that the trust industry drains revenue from the U.S. Treasury, which supplies almost half the state’s budget each year, he said. Still, Hunhoff said the proposals have bipartisan — and virtually unanimous — support. The last full week of 2013 was marked by an upbeat tone as the latest economic data exceeded expectations and major U.S. stock market indexes hit all-time highs. The advance for stocks came as investors digested big news from the previous week, which had lifted some uncertainty regarding fiscal and monetary policy. The Federal Reserve announced on December 18 that it would begin trimming its bond buying in January while keeping short-term interest rates low for longer than previously indicated. The U.S. Congress also passed a budget deal that sets federal government spending levels into 2015. Join Vanguard CEO Bill McNabb and Chief Investment Officer Tim Buckley on Thursday, January 9 for a live conversation on the outlook for the economy and the financial markets in 2014. As of midday Friday, the S&P 500 Index was up about 1.5% for the week to 1,842. The yield on the 10-year U.S. Treasury note was up 10 basis points for the week to 2.9%. This article will be updated with the week’s final figures after the markets close. After slipping a little in October, personal income resumed its upward trend in November with a 0.2% monthly increase. The figure includes a rise in wages and salaries of 0.4% thanks largely to payroll increases in the private sector. Despite the modest income gain, spending climbed 0.5% on a monthly basis in November, driven in large part by spending on big-ticket items like automobiles. An improving labor market, along with wealth effects from a surge in the stock market and rising home prices may have made consumers more disposed to spend. Real consumer spending has increased at an average annualized rate of 5.7% in the past two months, an encouraging sign for broad economic growth in the last quarter of 2013. With spending rising faster than income, the saving rate dipped from 4.5% to 4.2% in November, a nine-month low although still well above the pre-recession levels seen in 2006 and 2007. Broad prices remained nearly flat for a second month, and underlying inflation remained low, with core prices (which exclude the often volatile components of energy and food) inching up a seasonally adjusted 0.1% over the previous month. On an annual basis, core inflation was running at 1.1%, well under the Federal Reserve’s target of 2%. Orders for long-lasting goods manufactured in the U.S. rose by 3.5% in November on a monthly basis, more than double market expectations. Part of the solid number came from the very volatile civil aircraft component, which rose more than 20% (aircraft orders at Boeing jumped from 79 in October to 110 according to the company’s website). Orders for vehicles and parts were solid as well. The more encouraging development was in orders for nondefense capital goods excluding aircraft. This category, which is closely watched as a proxy for business spending, climbed 4.5% in November after having posted weak readings for most of the year. After surging from 403,000 in September to a five-year high of 474,000 in October, sales of new single-family homes slipped back to a seasonally-adjusted annual rate of 464,000 in November. Market analysts were expecting a bigger retrenchment to 445,000 units. There were significant regional variations: the West was up more than 30% in November and the Midwest was down by well over 20%, while the Northeast and South fell between those extremes. Taking a longer perspective, new-home sales were up 16.6% compared with November 2012. With the number of new homes on the market shrinking, inventory fell to 4.3 months of supply at the current sales rate. The tight market contributed to a rise in the median price of a new single-family home to $270,900 in November, 10.6% higher than a year earlier. Next week will be light for reports. A gauge of consumer confidence is due out on Tuesday, followed by construction spending and manufacturing activity on Thursday. bp=basis points. 100 basis points equal 1%. For example, if a bond’s yield rises from 5.0% to 5.5%, the increase is 50 basis points. The economic statistics presented in this report are subject to revision by the agencies that issue them. For more information on the reports mentioned in this article, read our Guide to major U.S. economic reports. Is an Oracle/SAP bidding war brewing for Responsys? Last week, Oracle Corp. announced it was planning to buy cloud marketing software vendor Responsys for $1.5 billion in cash, or about $27 per share, a 38 percent premium over the price at the time. Great, except the price for Responsys’ stock immediately shot to $27.40, and its traded above $27 ever since. 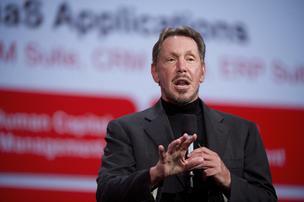 Buying at that price is a losing proposition if Oracle CEO Larry Ellison has his way. So what gives? Investors are betting that the $27 per share price isn’t as set in stone as it might first appear. The deal is still subject to approval by the shareholders, and isn’t likely to close until early in 2014, which leaves space for another company to step in with a counter offer. The big contender here is arch rival SAP, which was reportedly also kicking the tires on Responsys before news of the Oracle deal broke, according to the Wall Street Journal. If an ensuing bidding war drives up the purchase price, suddenly getting in at $27.40 looks pretty lucrative. Analysts have taken notice, and upped their price targets. In a research note, JMP Securities’ Pat Walravens, who follows the stock, set his target at $33, saying Oracle’s price is low compared to what other large enterprise software vendors have paid to get into the marketing space, so a counterbid wouldn’t surprise him. Salesforce, another big thorn in Oracle’s side, bought Responsys competitor ExactTarget for $2.6 billion in June. Even Adobe is in the mix, picking up the marketing automation company Neolane for $617 million that same month. The marketing software space has heated up in recent months as more and more outbound marketing moves online — opening scale and efficiency opportunities for companies that use software to track, manage, and automate their campaigns. And while it might seem passe in the era of social media, email is still the preferred medium for many types of outreach. Hence, the interest by many old-guard enterprise software vendors looking to bulk out their offerings in a growth industry. Regardless of what actually ends up happening with Responsys, all the buzz around its sale has already paid dividends across the marketing software space. Marketo, for instance, which is a Redwood City competitor to Responsys, shot up more than 15 percent on the news in $38.17 and has been trading in the high $30s ever since.